New analysis of Mars' terrain using NASA spacecraft observations reveals what appears to be by far the largest impact crater ever found in the solar system. Andrews-Hanna and co-authors Maria Zuber of MIT and Bruce Banerdt of NASA's Jet Propulsion Laboratory in Pasadena, Calif., report the new findings in the journal Nature this week. A giant northern basin that covers about 40 percent of Mars' surface, sometimes called the Borealis basin, is the remains of a colossal impact early in the solar system's formation, the new analysis suggests. At 5,300 miles across, it is about four times wider than the next-biggest impact basin known, the Hellas basin on southern Mars. An accompanying report calculates that the impacting object that produced the Borealis basin must have been about 1,200 miles across. That's larger than Pluto. A new study using this information may solve one of the biggest remaining mysteries in the solar system: why does Mars have two strikingly different kinds of terrain in its northern and southern hemispheres? The huge crater is creating intense scientific interest. The mystery of the two-faced nature of Mars has perplexed scientists since the first comprehensive images of the surface were beamed home by NASA spacecraft in the 1970s. The main hypotheses have been an ancient impact or some internal process related to the planet's molten subsurface layers. The impact idea, proposed in 1984, fell into disfavor because the basin's shape didn't seem to fit the expected round shape for a crater. The newer data is convincing some experts who doubted the impact scenario. "We haven't proved the giant-impact hypothesis, but I think we've shifted the tide," said Jeffrey Andrews-Hanna, a postdoctoral researcher at the Massachusetts Institute of Technology in Cambridge. Last edited by nick c on Sun Mar 27, 2011 7:33 pm, edited 1 time in total. Yep, I was just reading that this morning and thinking about posting it here... Sounds pretty far fetched, but still I don`t know enough of the Electric theory to point an exact alternative cause. Probably something to do with plasma discharge, I`m still new in this area. Dendritic Flux Avalanche vs. Dendritic Ridges? but I haven't seen the the link I see been laid as of yet. I was browsing [url2=http://www.thunderbolts.info/forum/phpBB3/viewtopic.php?p=4782#p4782]this thread[/url2] below and noticed something. Flux dendrites with opposite polarities simultaneously penetrate superconducting, ring-shaped MgB2 films. By applying a perpendicular magnetic field, branching dendritic structures nucleate at the outer edge and abruptly propagate deep into the rings. When these structures reach close to the inner edge, where flux with opposite polarity has penetrated the superconductor, they occasionally trigger anti-flux dendrites. These anti-dendrites do not branch, but instead trace the triggering dendrite in the backward direction. Two trigger mechanisms, a non-local magnetic and a local thermal, are considered as possible explanations for this unexpected behaviour. Increasing the applied field further, the rings are perforated by dendrites which carry flux to the center hole. Repeated perforations lead to a reversed field profile and new features of dendrite activity when the applied field is subsequently reduced. that looks an awful lot like the edge of a mars chasma. 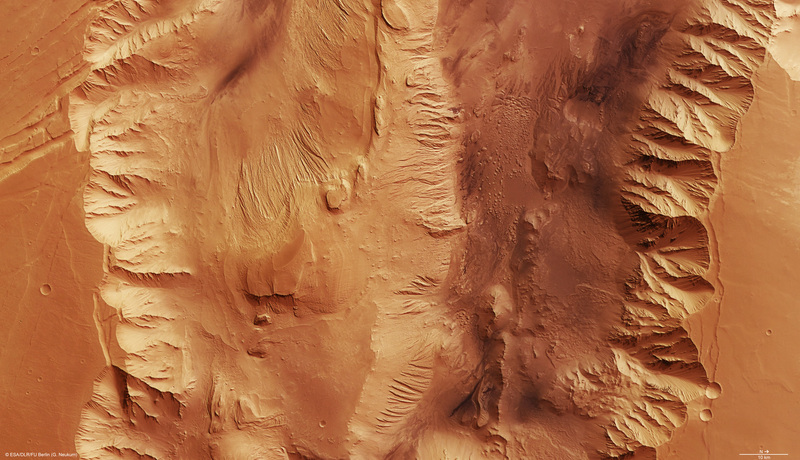 Are chasma's really big craters? As someone cynical once said, "Astronomers' only way of explaining anything is by smashing things together..."
Not exactly an elegant solution. But about the only one when all you have as options to consider are gravity and thermal effects. It's a good thing that dentists don't subscribe to astronomers' ethic, or they'd be smashing rocks together to generate their x-rays... And that would sure make a dentist's arms tired! substance wrote: Yep, I was just reading that this morning and thinking about posting it here... Sounds pretty far fetched, but still I don`t know enough of the Electric theory to point an exact alternative cause. Probably something to do with plasma discharge, I`m still new in this area. Well, I think we know what David Talbott's response would be... If one accepts the evidence he presents as internally consistent, and valid. It is a leap, of course. But he makes some interesting arguments that probably shouldn't be ignored (regardless whether the final analysis proves or disproves the hypothesis; sometimes, it's the search that yields the most fruitful activity one way or the other). Re: Mars chasma dendrites / flux dendrites? _sluimers_ wrote: I haven't been long enough on the EU to know, but I remember seeing mars pictures and EU explaining types of mars craters, but I haven't seen the the link I see been laid as of yet. I have absolute no idea what that means and what I'm looking at but I know one thing, that looks an awful lot like the edge of a mars chasma. Umm, yeah, about that... Freaking awesome! I especially like several of the videos. It's also interesting to see the morphology differences based upon temperature, going from strongly "channeled" to more widely "sprayed" / "cloudy" look. Again, thank you for this development. Seriously. I've been waiting for a connection along this line to be made. Will definitely read further into this ASAP. Guess I've got my work cut out for me, eh? And as an aside, here's a shot of a crater that's apparently been cut in half by whatever eroded away or ejected the contents of the Valles. I'll leave the mechanism up to the experts. But the stuff that was forwarded above certainly seems to match the dendritics ringing the Valles and argues strongly that SOMEthing interesting (and probably electrical) happened there. Re: Relationship Between Flux Dendrites and Dendritic Ridges? Oh wow, great! Does this mean I made a scientific discovery? Good enough to get me into a revised version of "A Short History of Nearly Everything"? _sluimers_ wrote: Oh wow, great! Does this mean I made a scientific discovery? This may renew or settle a couple debates (just my opinion). We'll see.